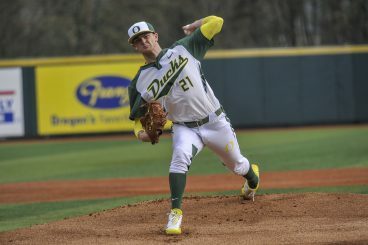 Stephen Nogosek joined an elite club of Ducks last week when he was named to the USA Collegiate National Team after posting impressive numbers in his three appearances during tryouts (5.1 IP, 7 K, 4 H, S). Combined with his excellent 2015 season for the Ducks, Nogosek looks to be a lock for the closing job vacated by Garrett Cleavinger. Nogosek should be the obvious choice after serving in the eighth-inning role for the last two years, and his experience in high-leverage situations combined with an impressive track record (7-4, 2.20 ERA, 87 K) give him a head start. Unfortunately for head coach George Horton, he may need to do some shuffling with his pitching staff in order to get everyone enough work. Matt Krook’s return will give the rotation a boost in 2016. With the 2016 season we will see the return of Matt Krook who may possibly be constrained by an innings limit, making Horton’s job much more difficult. Thankfully for Horton and the rest of the staff, Krook will be playing summer ball with the Wareham Gatemen in the Cape Cod baseball league, where the extended work should help his transition back from Tommy John surgery. The lefty shined in his freshman season, posting a 1.79 ERA and 60 K over just 45.1 innings of work before having his season cut short by injury. Without this extra work there might have been some rumblings about Nogosek entering the starting rotation, or at least performing in a long relief role reminiscent of Connor Harber‘s to begin 2015. The situation may still work itself out that way, depending on the performances and workload of Nogosek and Krook over the summer. Assuming all goes well in the off-season and Krook can return to full form, ready to put up another impressive campaign, a question remains about what Horton will do with his bullpen that was so effective in 2015. 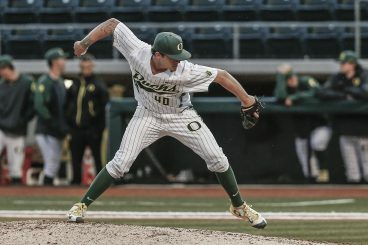 Nogosek showed signs of breaking down over the stretch, so his summer league play may have the opposite effect of Krook’s, wearing himself down further and ultimately hurting his chances of being productive for the Ducks. The deceptive Cooper Stiles should see more high-leverage situations next year. Should Horton have to dig deeper, the prolific Cooper Stiles jumps off the page as a potential sleeper for Oregon. Generally, managers tend to shy away from side-armers in the closing role, fearing that the approach is gimmicky, but Stiles went 3-1 with a 3.56 ERA with a 30:9 K:BB ratio in 2015. His unconventional approach led to problems at times as he plunked a team-high 15 batters. However, last year was his first full season using the new delivery, so we are likely to see an improvement in his control moving forward. Regardless of the situation in which he is used, be sure to keep an eye on the former walk-on Sheldon High School graduate. The Ducks managed to pull their season together enough to make the playoffs a fourth consecutive season, but a first-round exit was not what they were looking for. 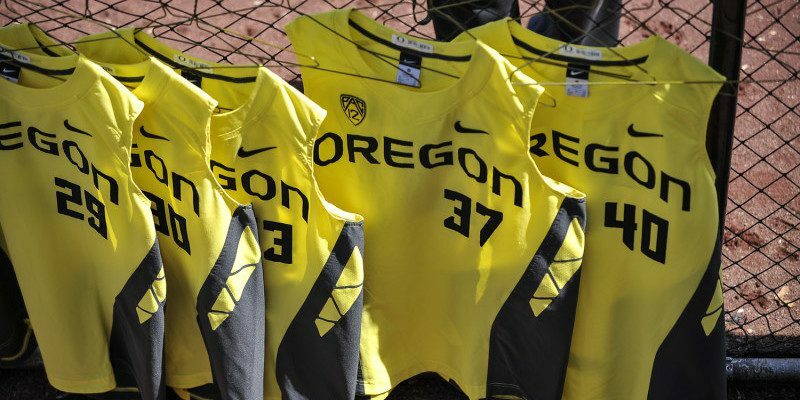 Nine other Ducks will be participating in summer leagues, preparing to come back strong and make another title run in 2016.